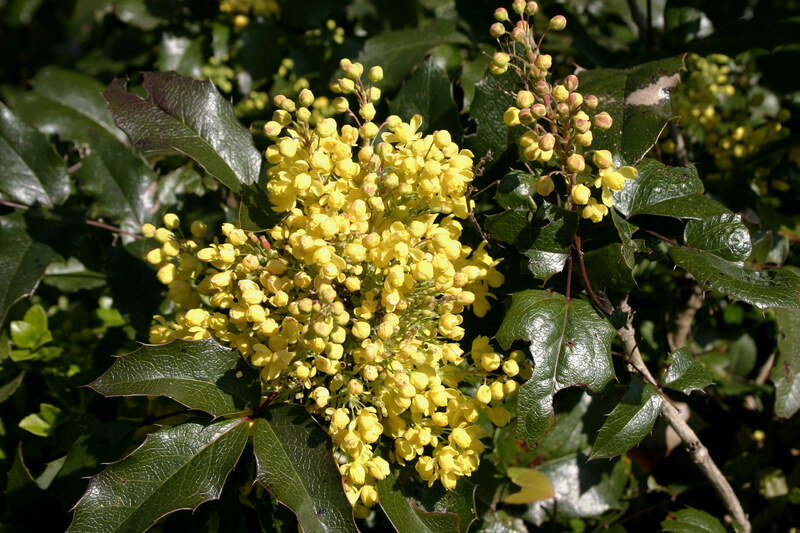 Mahonia aquifolium is a shrub to 2 m (mostly to 1 m), evergreen, often colonial from stolons. Leaves alternate, pinnate, to 30 cm long, leaflets 5-9, opposite, to 8 cm long, egg-shaped, margin with spine-tipped teeth appearing very similar to American holly leaves, shiny, dark green above becoming purplish in autumn. Flowers yellow, small, radially symmetrical, sepals 9, petals 6. Both free; inflorescence of unbranched clusters to 8 cm long, at ends of stems. Fruit fleshy, dark blue, 0.8 cm wide. Origin: Oregon and British Columbia. Habitat: Not known to escape from cultivation. Probably an overgrown horticultural specimen.